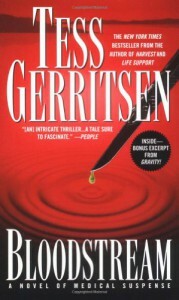 This is one Tess Gerritsen earlier work, not part of her Rizzoli and Isles series. A lot happens in this book, but it wasn't very easy for me to connect to the story. I wanted to really like this book (as I know a lot of Tess Gerritsen fans), and I thought it started of great, with a high level of creepiness. But then, the story lost me a bit. There's something going on, indeed, and every five pages, there's another explanation for it. I understand that you want to distract the reader and keep him/her guessing on what exactly happens next, but if you spell literally every option out for me, I tend to get a bit annoyed. It was however an enjoyable read.